The San Luis Delta Mendota Water Authority held its Thursday, April 4, 2019 meeting at its Los Banos headquarters. They have good snacks, let’s get that clear. Those sweet and salty granola bars – they’re so good. I was sitting next to a friend of mine from Friant, Doug DeFlitch when just before the meeting began the room got quiet. Like a flock of birds or school of fish turning in unison – everyone just got quiet all at once. It would have been a prime opportunity for Chairman Cannon Michael to drop the hammer and start things. He didn’t do so but it seemed like most everyone noticed the shift. Well, about 9:30 Michael did start the meeting and we all saluted the flag together, like a flock of birds and a school of fish, we did so in unity. Unlike a flock of birds or school of fish we did so of our free will. I hope the next generation understand why freedom is worth fighting for. The consent calendar was approved and SLDMWA Executive Director Federico Barajas explained the new strategic plan’s goals and objectives. Martin Rauch was present and he was one of the driving forces to put the plan together. The board was happy with the work and approved the plan. J.Scott Peterson gave the legislation report and the board approved supporting SB 487 which will help fund the NASA Airborne Snow Observatory flights. The other bill was AJR 8 – Assembly Joint Resolution – asking the feds for some money to help eradicate nutria from California. I spoke up and said nutria are good eating and served in some of New Orleans’ finest restaurants, but Bill Pucheu of Tranquillity ID said they also serve mud bugs – crawfish. In my opinion they taste good, you just have to eat a lot of them. The board was asked to buy $50,000 from the Technical fund to bring more science to the Voluntary Agreements in the Bay-Delta Plan. Compass Resource Management Ltd, proposal along with other CVP contractors. Tom Birmingham, Westlands WD said there are some serious questions of the current guidelines. He said using the X2 salinity line as it is being used to manage smelt is not a good use of resources. The board approved. Next Andy Sells ACWA JPIA gave SLDMWA a giant check for $107,108. The Association of California Water Agencies has a special insurance package for members – Joint Power Insurance Authority. Sells said the San Luis Delta Mendota staff is the hero in keeping costs down. That was fun. Rauch was introduced by Barajas to walk the board through the proposed mission statement, vision statement and core values. I didn’t find these in the packet so I’m having to guess a bit. Barajas asked for comments to be sent to him by the 19th of this month. Rauch said the statements and values are outlined as well as the reasons for having them. He encouraged everyone to look these material over and return comments. Birmingham suggested the documents be sent to directors in Word. Peterson and consultant Dennis Cardoza (by phone) gave an update. Peterson said the SLDM suggestions for the biops were submitted to Valley congressmen for consideration. I think it was biops. Peterson there are discussions on water infrastructure taking place in Washington so get your requests to Peterson. Cardoza said he was in Sacramento to deal with a Senate Bill by Senate Pro-tem Toni Atkins SB1 to lock in all the regulatory rules that were in place when Obama was still in office. This a blatant snub to President Donald Trump and a dangerous precedent. This would also lock in the current biological opinions and rout any hopes of improving the voluntary agreements. Birmingham said this bill was first presented on the day after Trump was sworn in. It didn’t pass then but Cardoza said it appears to big support with the legislature this time around. There will be a hearing on the 9th at the Senate Water Committee. Cardoza said most folks believe this will become law unless there is a massive effort to kill it. Birmingham suggested the board allow Cardoza and Barajas to voice opposition and since it wasn’t itemized on this agenda the board can ratify the action next month. Cardoza said no one can recall in recent times any bill titled SB1 not passing. Scary stuff. Barajas said raising San Luis Dam is still ongoing. SLDM is working with the Bureau and there should be an outline of tasks produced by the Bureau soon. Steve Stadler, GM James ID asked for a more detailed financial information. Francis Mizuno, Assistant GM said that is possible and its is a relatively small amount so there may be other agreements needed to move this along in the future. Garth Hall, Santa Clara Valley Water District said the Pacheco Reservoir is moving along and some mile stones are being met. Chris White, Exchange Contractors said there was nothing to report on Temperance Flat. Tom Boardman, now working for Westlands gave his usual excellent report. He reported the federal share of San Luis Reservoir filled up last month. The Jones Plant shut down for a day to clean trash racks and conduct an experiment in killing predators with dry ice. There was some deal of concern these tasks might take longer than planned and since ag water is worth far more than dry ice the Bureau agreed and the work was completed on time. He said there is more snow in the Sierra than in 2017 below 8,000 feet. He said the cool weather has kept the big melt from happening yet. So there is more water than anticipated and one of these days there will be a lot of water coming down the hill. He said the forecast for cooler weather extends later in April. Boardman said any historic demand should be met. He’s been working with Russ Freeman also with Westlands on a report to be submitted to the Bureau today making a very strong case for raising the Allocation to 100 percent immediately. He said if you go back to the 1980s there were higher exports with less supplies all things being equal. Hall asked if there would be high flows on the San Joaquin River through the fall to impact the X2 line. Boardman said there could be lower depletions during the fall that means less water needed to be released to push back the X2 line. Birmingham said it would be worthwhile to look at purchasing water from the tributaries this fall to push back the X2 verses lowering pumping. Barajas gave his report saying he’s looking at a May tour of Shasta Lake and McCloud River. This would be an agendized board workshop. The board was given a choice of the 17th or 30th. It appeared May 30th was the best day. The plan will be to spend the night in Redding the night before to get an early start on Shasta Dam. That would be a fun trip. The next step would be for the board to have a policy level discussion about storage after the tour. Barajas said he’s been coordinating with the Bureau on getting an assessment on what’s happening with subsidence on the Delta Mendota Canal. The Bureau is involving personnel from Denver to conduct a look at the entire canal. He said he’d bring the bill for this to next month’s board. Barajas said SLDMWA has signed the MOU with the Bureau on the re-consultation I think. Michael said there were no committee meetings so there were no committee reports. Mike Wade of the California Farm Water Alliance said he’s been working with Mizuno on getting editorial placement on the transmission line. He said he’s worked up an informational piece for Ex Con about what’s been going on for the last 100-years he’s very proud of. The Cultivate California website has been really drawing. He’s had 40 million impressions on the social media advertisement. He said he’s reached twice as many folks for a third of the cost of 2015. Most of the traffic has been in Los Angeles, the Bay Area and Sacoftomatoes. Mizuno reported if the allocation goes up the less transfers will be needed. She said the Yuba County water transfers don’t have the pumping capacity to go through at this time. She gave the board and update on the transmission lines project. There are a lot of moving parts on this. The design is finished and she said if things go smoothly there should be funding. May it go smooth for her. The meeting went into closed session. 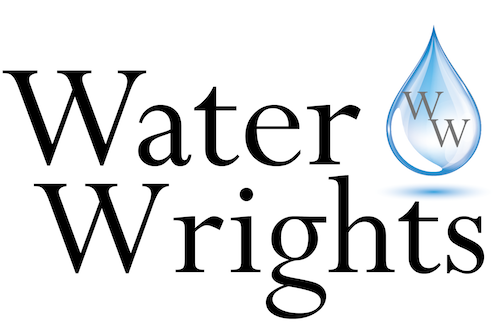 DISCLAIMER OF RESPONSIBILITY; Waterwrights strives to provide his clients with the most complete, up-to-date, and accurate information available. 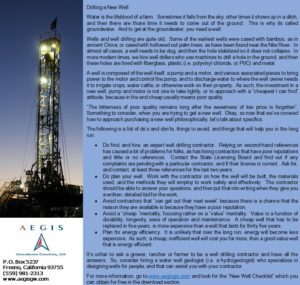 Nevertheless, Waterwrights does not serve as a guarantor of the accuracy or completeness of the information provided, and specifically disclaims any and all responsibility for information that is not accurate, up-to-date, or complete. Waterwrights’ clients therefore rely on the accuracy, completeness and timeliness of information from DAW entirely at their own risk. The opinions expressed in this report are those of the author and do not represent any advertisers or third parties. 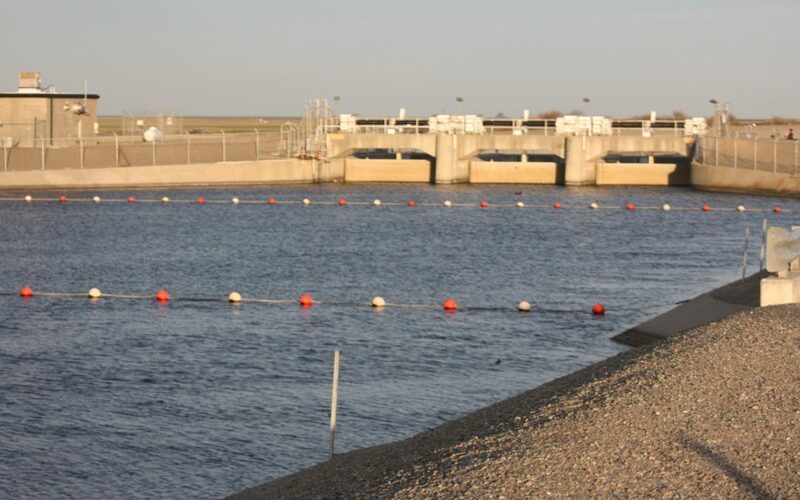 SAN LUIS & DELTA-MENDOTA WATER AUTHORITY was established in January of 1992 and consists of approximately 2,100,000 acres of 29 federal and exchange water service contractors within the western San Joaquin Valley, San Benito and Santa Clara counties. The governing body of the Authority consists of a 19-member Board of Directors classified into five divisions with directors selected from within each division. The main conveyance is the Delta-Mendota Canal that delivers approximately 3,000,000-acre feet of water within the Authority service area. Of this amount, 2,500,000-acre feet are delivered to highly productive agricultural lands, 150,000 to 200,000-acre feet for municipal and industrial uses, and between 250,000 to 300,000 acre-feet are delivered to wildlife refuges for habitat enhancement and restoration. Chairman: Cannon Michael, Executive Director: Francis Mizuno (Interim), Attorney: Becca Ackroyd.